I think this suggestion may be buried in other threads but I woudl like to call it out here specifically. I am about to paste a board that came with some components pre-soldered. Now I woudl like to paste the remaining footprint(s) of the board, add the component(s) and bake. I am worried the nozzle with collide with the existing components. It would be good to be able to mark sections of the board that the nozzle should not enter. The quick and dirty solution is to have the raise height configurable. So that you could set the nozzle to raise to 10-15 mm after each dispense. This would clear soldered components, but it will dispense painfully slow. Graphically marking a no-fly zone would be cool, however it will take some time to implement. I've made a note of it in our issue tracker, but we have a backlog of Gerber issues to fix and are trying to fix the software disconnect during bake problem that many users have seen. If other readers want this feature, now is the time to speak up and we'll bump it up the priority queue. How did you come across these pre-soldered boards? I'm just trying to think understand the use case. Are you trying to re-work some boards? So I would like to mount the esp32 module to the white breakout for example. One workaround for the moment would be to include only the IC footprint in your gerber files. 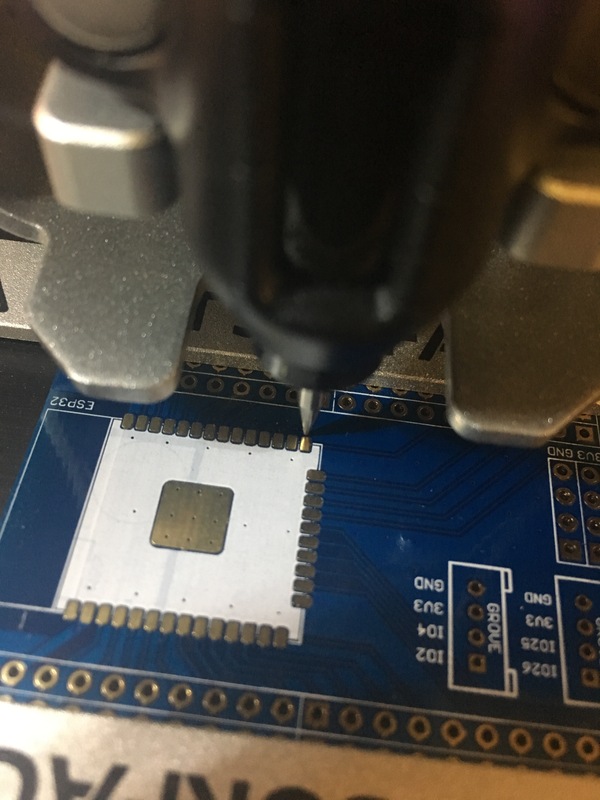 That way the V-One will only probe and paste the IC - no need to worry about crashing into the other components. I need to check the footprint for the pad alignment (I did not make the footprint) so I am not concerned about the x/y location at this point . It's just the shape is messed up and not filled in. 1) Was there a bunch of paste build-up on the nozzle? In that case, the paste is not adequately sticking to the metal. I would suggest cleaning the pads with some isopropyl alcohol, and purging a bit of paste from the nozzle to ensure it's fresh. 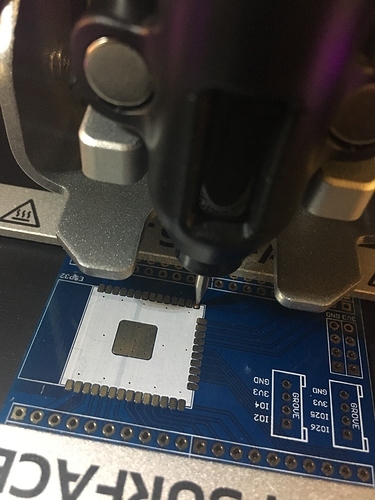 Also, make sure that the print height is correct (0.14mm) and re-probe the board. 2) If there is no build-up on the nozzle, then it looks like there wasn't enough paste being deposited. In that case, try to manually dispense a bit of paste (don't push too hard) and see if there is a clog. Also, check the cartridge to make sure there's no paste leaking past the piston. 3) One (less likely) possibility is that there is some unfavorable interaction between the paste and the soldermask. Our tests in the past showed that conductive ink would dispense quite well on any substrate we tested, with the exception of a particular white soldermask, which lead to poor resolution. It's unlikely, but perhaps the paste has poor surface interaction with that soldermask - I'd suggest trying again when the component footprint is aligned properly. Those are my suggestions based on the image, but keep me posted! Keep an eye on the nozzle as it prints, perhaps you'll notice something else that might give some more insight into the issue. Hi @mewertow, the print height was set to .64mm not .14mm. I was messing with that before but I was doing it when talking to you or Jesus and I can't recall why now. But ... On another note I am having a heck of a time getting this board aligned. 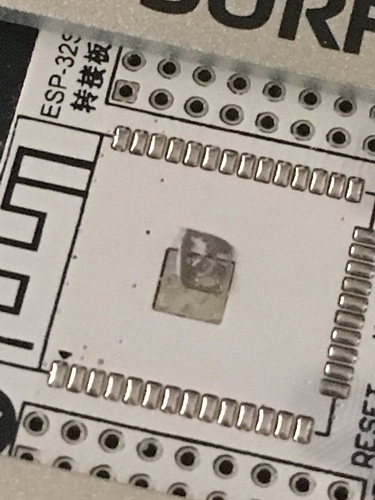 Now the foot print i am using was not actually used to print the PCB but it should be close. I am getting some angle skew (which happens). Even when I center both pads things don't line up after that. The first point is still correct but the second point is not where i put it in the alignment step when i test it in the next step. Are there any known alignment issues with .90? when it comes to board skew? I took a few photos and a mini movie, let me know if you want to see them but when testing the alignment points the second is not going back to the same place where it was in the setup. please share the vids and the gerber files. I'll try to reproduce here. I don't have a starting picture for the first pad but you will see that placement anyway in the alignment test. Second pad initial placement based on file - you can see that it's off and I have to move it which indicates the board is not square. (even though it looks square to me). @troy Any thoughts on what might be happening? @a2retro I'll have a look today and let you know what I find. Just to check, do you have alignment issues with other designs, or is the issue isolated to this design in particular? @mewertow I haven't had any alignment issues so far till I got to this design but that said i haven't done a lot. I can try another design later tonight. So I just tested another design with V.10 of the software and it worked fine. I will put the other board back and try it again. I am convinced now the paste file i am using doesnot exactly match the board. If i locate the initial pad and then let the software move the head to the second pad and i make no adjustments then the entire bottom row is spot on but the row on the right and the top row are all off a consistent amount. 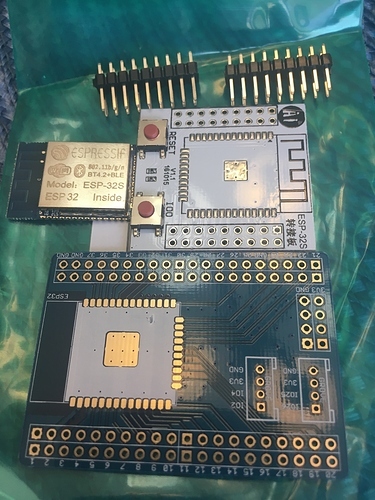 Sorry if you wasted much time on this but to apply paste to these boards I will try adjusting the footprint in Eagle to match if I am unable to get the Gerbers from the original source.. I respond to help give you a feel for the level of interest here. I too would be interested in a “no fly zones feature” and I also think that the solution @jazozaya suggests (of raising the print nozzle) is a perfectly good work around. I look forward to seeing what features the V-One will have to offer in the coming months.